Join us! 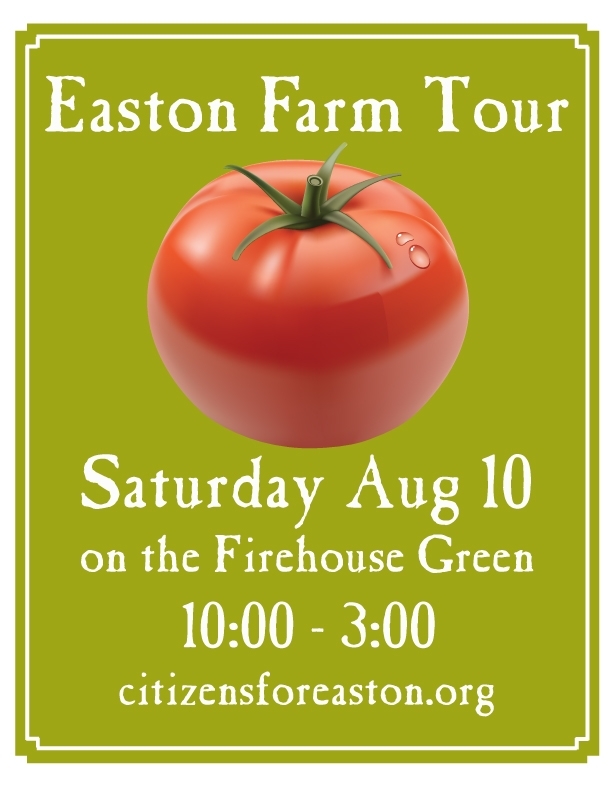 Easton Farm Tour kicks off at the Easton Firehouse Green on Saturday, August 10, 2013! Join us for the 5th Annual Easton Farm Tour – Saturday, August 10, from 10am to 3pm. This celebration of Easton, a local farming community within Fairfield County CT, is a self-guided tour of Easton farms. This free event begins at the Easton Firehouse Green, One Center Road, Easton, Connecticut. Here visitors check in and pick up an event map and pass to events and incentives offered by farmers and community organizations at the different locations throughout day. Fun for the whole family! Come and enjoy the many farming delights that Easton has to offer and learn where your food comes from. Enjoy tastings, hayrides, pony rides, living history with 18th and 19th century farm house living and cooking demonstrations, old-time fun and games, petting zoo, greenhouse tours, fruit and vegetables fresh from the farm, and pick your own activities. Visit the over 10 Easton farm locations participating in this year’s tour. Discover the opportunities to shop in Easton year-round for your season agricultural products and services, including fresh veggies, fruit, honey, eggs, mulch, herbs, meat, flowers, rare and unusual orchids, Christmas trees, horseback riding, educational events, or classes on animal husbandry and healthy eating. Learn about 18th and 19th century farm life and experience Revolutionary War food preparation from the Easton Historical Society at the Historic Bradley-Hubbell House Farm where docents in period clothing will be conducting live demonstrations throughout the day. Citizens For Easton, event sponsor, invites you to come on back to the green throughout the afternoon to enjoy food and entertainment on the green and visit with some of the Easton organizations who support our Easton farmers and farmland preservation. Skinny Pines – an Easton-based purveyor of wood-fired pizzas – will be on site with their mobile wood-fired oven selling pizzas, Dan Tressler’s String Fingers Band will be performing live music, and the Easton Community Center will engage you in some old-time fun and games. Learn about preserving and storing the produce from local farms and how to “grow your own” at the UConn Master Gardener booth. Visit with the Easton Public Library and pick up your copy of the Easton Farm Tour reading list. Learn about farming initiatives on town land from the Easton Agricultural Commission. Learn how The Aspetuck Land Trust is a friend to agriculture and devoted to preserving open space and natural resources in Easton, Fairfield, Weston and Westport and learn about the 34-acre Randall’s Farm Nature Preserve, once a dairy farm, now open in Easton. I have posted your event on our website. Sounds wonderful.